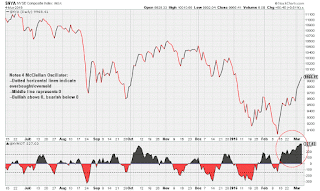 In late November of 2015 I talked about the Bulls being in trouble when it came to the Market. It took around a month until the Market entered a violent correction that lasted a few months. During this correction the Market on corrected around 17-20% (Nasdaq, Dow, S&P 500). After watching the Market continue to bounce since mid-February I have come to the conclusion that the Market may be starting a new uptrend (a pullback may be in order here first). I must admit I was actually expecting more of a correction (looking for the Nasdaq to make a new 52 week low). Part of my reasoning was because a lot of oil companies were heading towards bankruptcy this month, thus possibly triggering a negative domino effect throughout the world economy. However, in the last week a trend has emerged of successful debt restructure for a lot of oil companies. Therefore, buying them extra time. Another reason I was quite bearish was in 2000 and 2008 (approximately 8 year intervals), the Market experienced massive corrections. Following this interval the next crash would be due in 2015/2016. In a way, the Market did receive a sizable correction in the form of a flash crash in August 2015, and a correction from Dec 2015 to February 2016 (just not as bad as 2000/2008. The fact that a lot of pundits had noticed this premature pattern made it less likely to have such a strong affect on the Markets. Especially with the Fed and Central Banks having so much control over the global Markets since 2009. (Perhaps the new wave of successful debt restructuring of oil companies is due to the Fed behind the scenes). 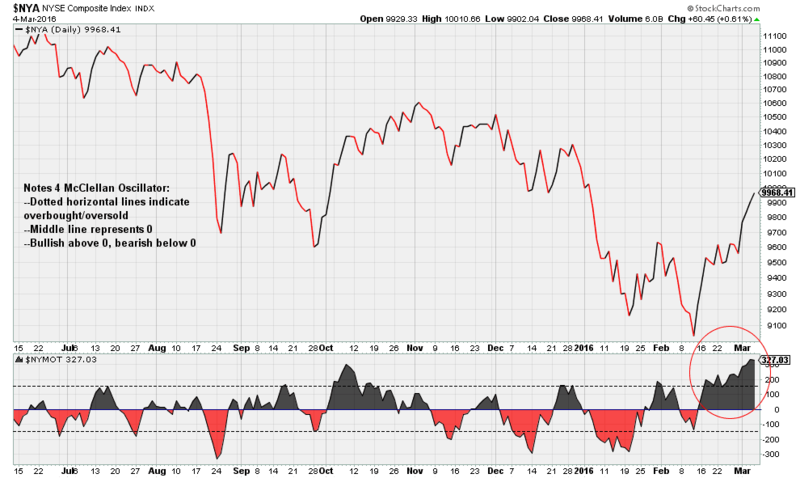 Finally, the last and strongest point to why I would not be surprised the Market may start a new strong uptrend is the McClellan Oscillator (shown above). Its currently at ~324. Readings above 300 are quite noteworthy. Some chart technicians may argue that this record-breaking reading is foreshadowing of the Market putting in a final top before a collapse. That to me seems unlikely. When readings like these occurs (after a pullback to work off the overbought condition occurs) the Market ends up going much higher. Based on the reasons above, I believe it is likely the Market is heading higher.